Portable gaming monitor is the latest sensation in the market. These screens vary from sizes of 15 inch to 24 inch. The monitors are slim and hardly take up any desk space. Due to the very reason, they can easily be carried around by being placed in bags. Portable gaming monitors have really made lives of gamers super easy. Now they can indulge in the gaming experience at anytime and anywhere. The display too is worth the praise and can be used for tasks other than gaming as well. Thanks to the evolving technology, people can now enjoy gaming as well as do routine work by just connecting through USB or HDMI. Portable Gaming Monitor are also specifically beneficial for university students who can fulfill both their entertainment and work purposes with this potable monitor. This detailed product reviews below will give you an insight to the basic specifications of every monitor. This in return will help you decide which monitor to buy next. Learn more about portable monitors here. Are you tired of facing looking for the best portable gaming monitor? Worry no more because GAEMS brings the right monitor for you. 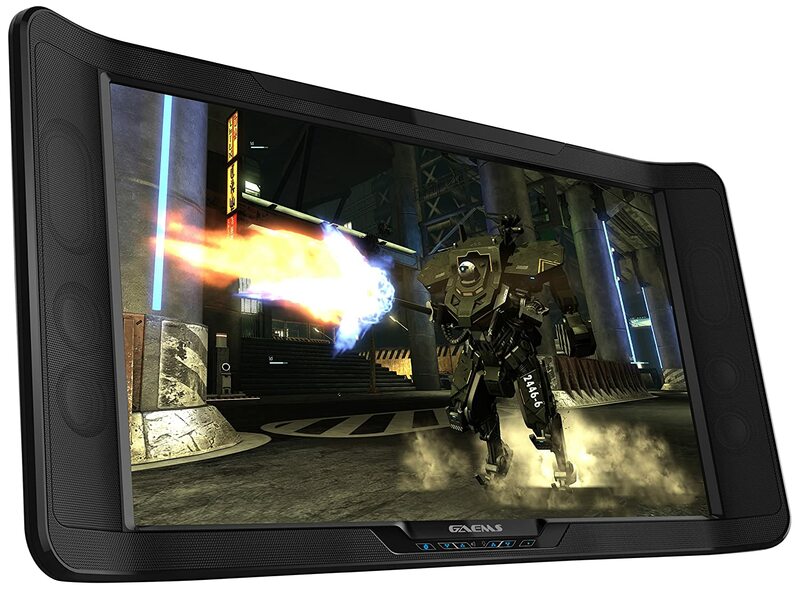 They have designed the M-240 gaming monitor keeping in mind all the customer expectations. This 24 inch classy monitor will surely give you a complete and lag free gaming experience. It has an astounding resolution of 1080p with full high definition and LED display. The LED display is highly efficient and produces remarkable picture quality. Gaming is all about the sounds and graphics. The dynamic sound system has 4 chambered speakers and a subwoofer that delivers best performance. The monitor has two HDMI ports which allow the user to attach 2 consoles at the same time. VESA mount handle can turn till 180 degrees to suit user’s angle. Moreover, the monitor can easily be carried along to places by securing it with a protective cover. Customers were happy with all the monitor features, from display to sound system. The only issue was with the monitor being a little heavy. All in all about 61 percent of the users gave it a full 5 star review, based on perfect gaming experience. This 16 inch portable gaming monitor is sleek and stylish. The Piano black glossy finish is what makes the monitor elegant and classy. It has a USB type 3 connection which achieve higher transfer rates. 5 ms response time ensures that there is no lag or error in fast moving scenes. Resolution of 1366 x 768 further perfects the image quality. Aspect ratio of 16:9 displays larger and bigger images. Foldable flexi stand makes it super easy for the user to place the monitor both vertically and horizontally. There are also VESA mount holes so that the monitor can be mounted on wall to save desk space. Apart from being stylish, the monitor is extra lightweight. This makes it easy for the user to carry it to places. Users can even put it in their backpack or the carry case that comes along. Built in DisplayInk USB graphics makes it possible to connect multiple USB monitors with one laptop or PC. Customer reviews weren’t that satisfying. They had problems with connecting the monitor as well as its normal functioning. Due to these reasons, only 44 percent of the users gave it a full 5 star review. This is a full package for all the gaming addicts. This portable gaming environment allows you to game at any time anywhere with all the necessary equipment. As an attraction, it is compatible with PS4, Xbox One and Xbox 360 consoles. The case, firstly, is made of strong materials that gives it a rugged look and secures all your accessories inside. 19 inch display inside is perfect with full high definition LED display and resolution of 720 pixels. Apart from gaming, it can even be used for casual entertainment like movies and/or videos. Right beneath the screen is the controls for volume and brightness. There are also headphone jacks provided along. As supporting accessories a shoulder strap is given to carry the bag easily around. HDMI cable, power cable and remote control come along as well. GAEMS vanguard is all you want to take your friends gaming sessions to a next level. It doesn’t matter where exactly you are, all you need to do is take out the gaming case and enjoy the lag free experience. Customers were extremely satisfied with the great display and sound system. Some issues, however, were faced with the HDMI connection and a light buzzing sound. Other than this, about 68 percent of the users gave it a full 5 star review. Asus is a renowned brand when it comes to technology related products. Like other famous brands, ASUS gives it level best to stay in the competitive industry. Similarly, they have come up with this portable gaming monitor to suit the requirements of gaming addicts. This 15.6 inch screen has full high definition display that produces remarkable picture quality. Built in IPS display produces the best color levels and offer amazing viewing angles. In terms of connectivity there is a USB 3.0 cable so that connection can be extended for data transmission. It is considered to be the slimmest monitor that has a very sleek and stylish finish to it. It also has an adjustable stand which makes it easy to place it on the desk. The slim design, however, takes very little space on the desk and fits everywhere. To top it off, ASUS gives a 3 year warranty so that users don’t have to worry about anything in case any error occurs. Customers, however, had a lot of complaints regarding this monitor. Despite being easy to install, the image quality was not up to the mark. There were also issues with the USB connection. All in all, about 45 percent of the users gave it a full 5 star review.